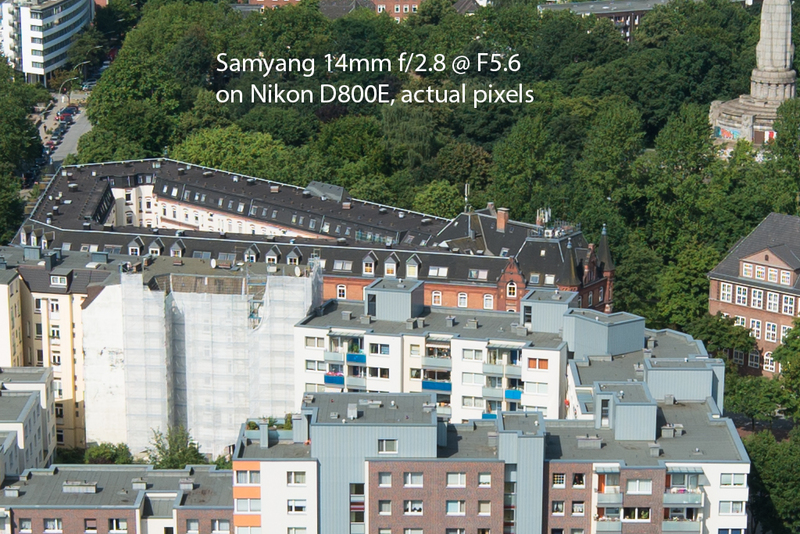 Although the resolution is quite OK, the Samyang has a significant problem with high contrasts at F2.8. 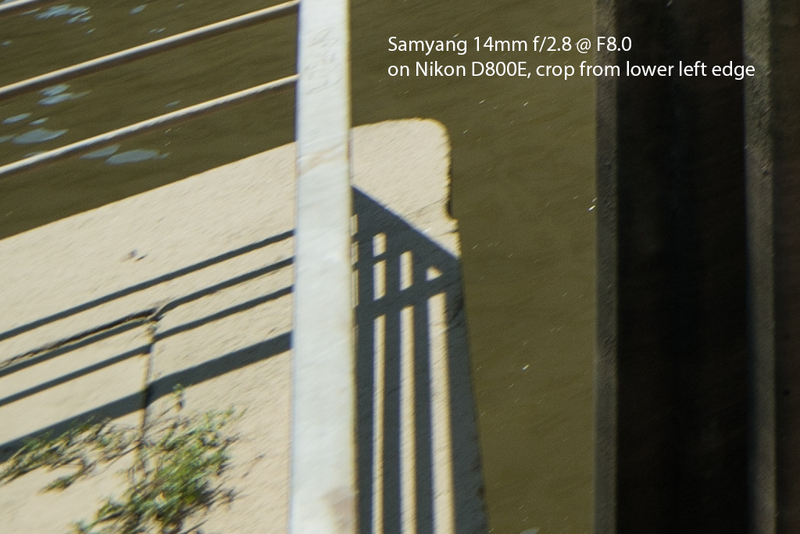 If you want to avoid that "glow" you will have to stop down the Samyang at least to F3.5 or better F4.0. 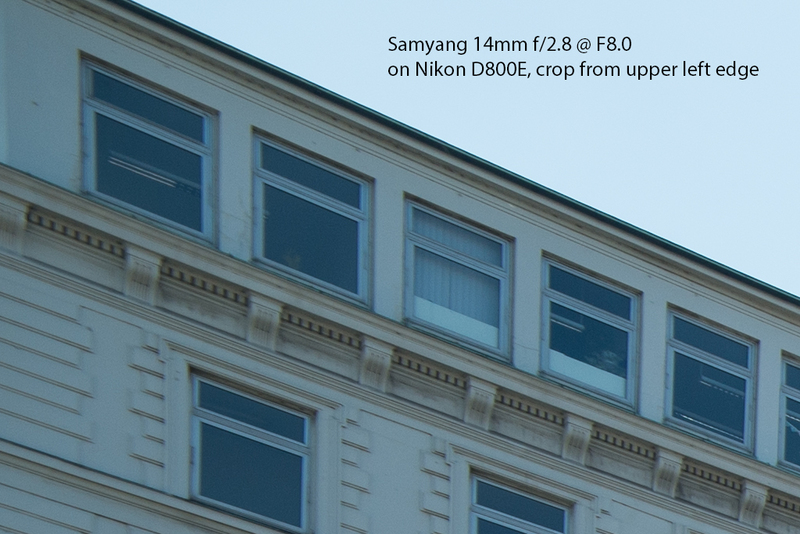 You will see another open aperture comparison at low light / low contrasts later in the "bokeh" comparison where the Samyang has less problems. 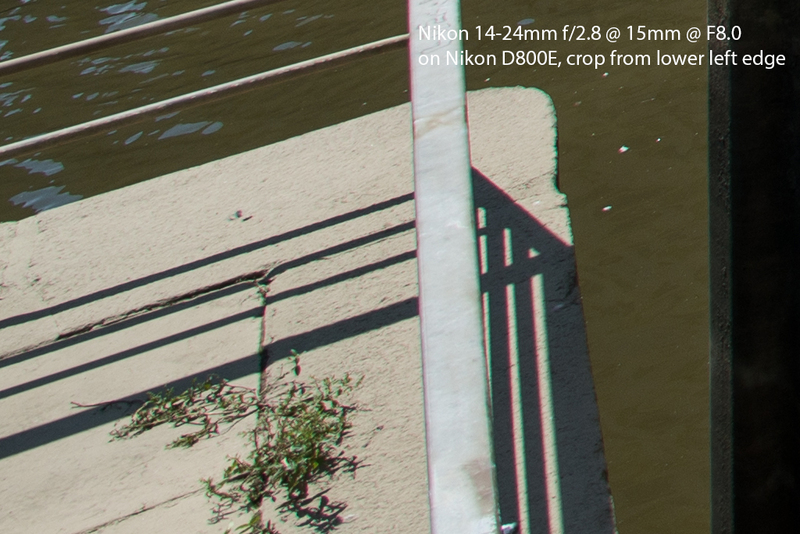 These examples show that the Nikon Zoom delivers the sharpest boarders but suffers from some chromatic aberrations (which can be quite easily corrected by software). 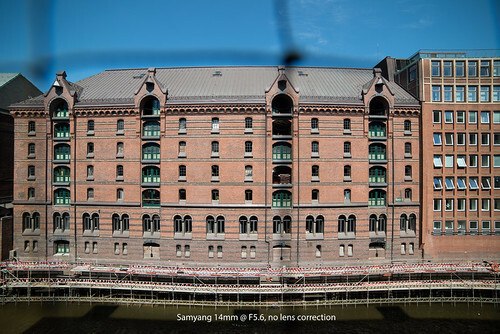 The Samyang makes a surprisingly good job here. 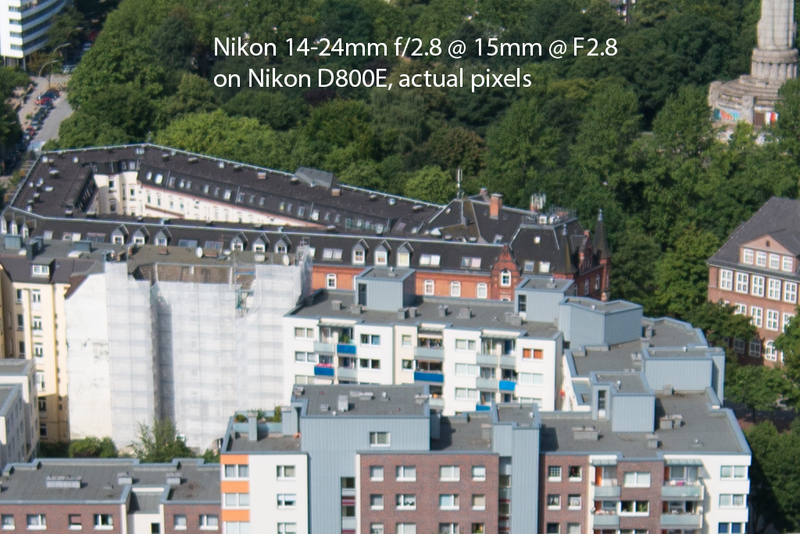 At this extremely high sensor resolution the Nikon zoom reaches it's limit and can not keep up completely with the prime lenses but on current full frame cameras you will propably not notice that difference. 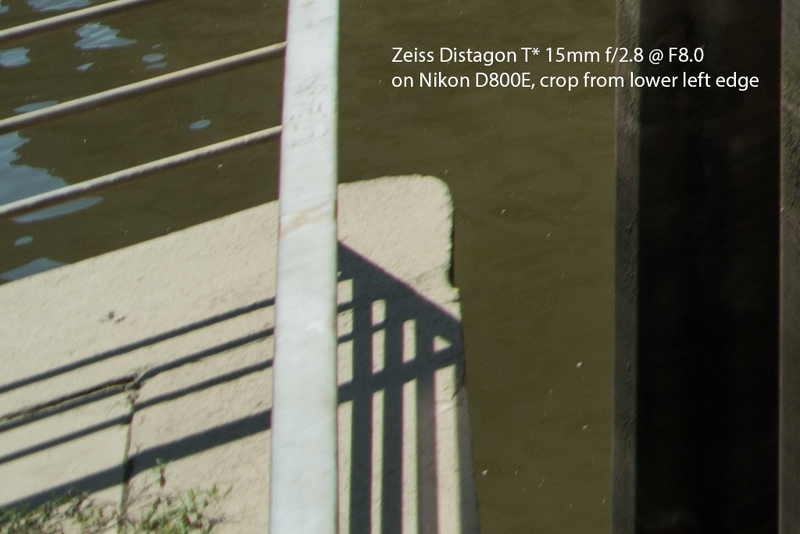 The Zeiss again shows a little better contrasts compared to the Samyang. 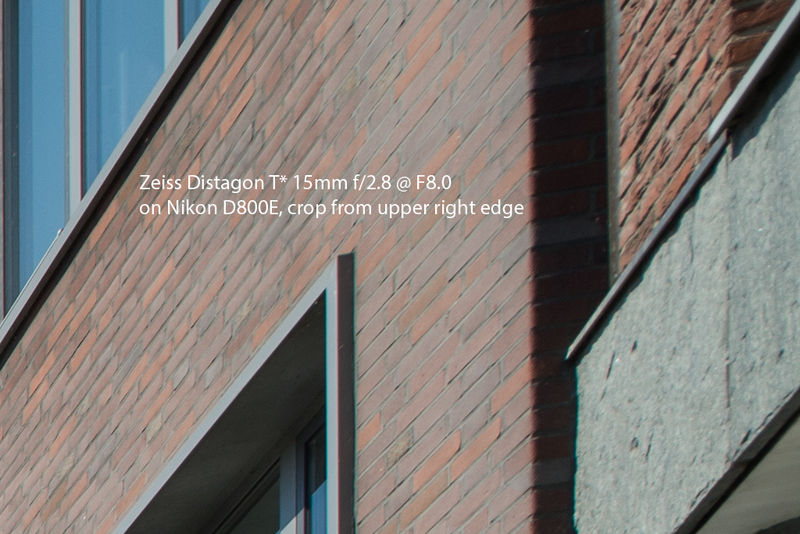 After already inspecting the left and right borders also in the edges the Nikon zoom shows the best performance. 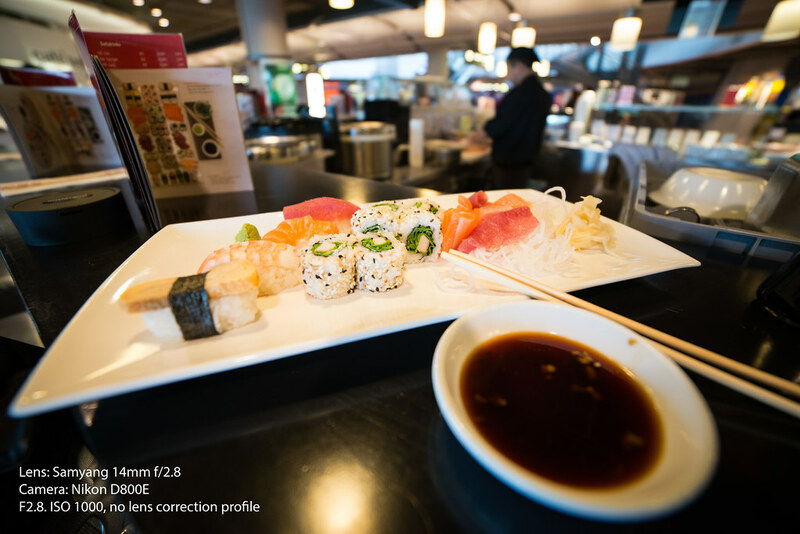 The little CAs can be corrected easily. 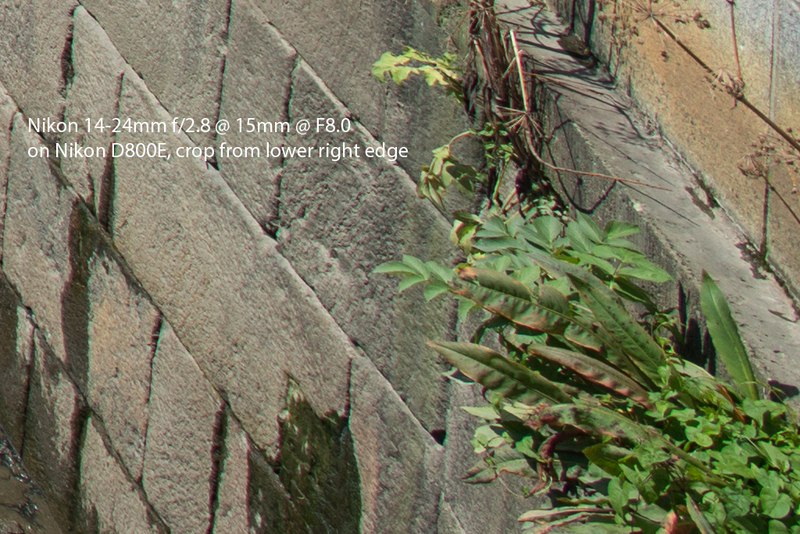 I noticed some articles explaining edge blur with field curvature (e.g. 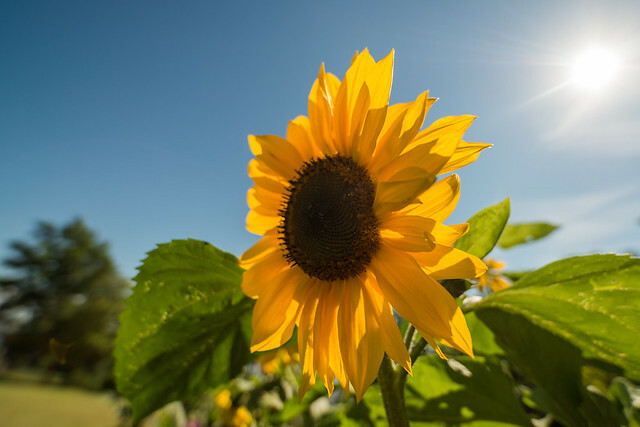 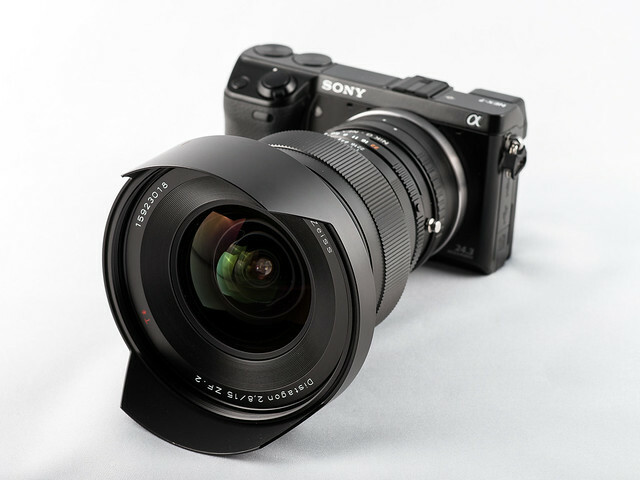 in this article from Lloyd Chambers if you have an account for his site but this applies to a different type of lens). 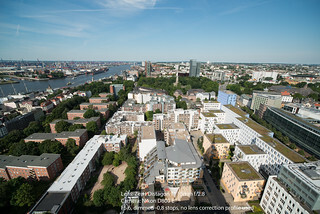 But when you shoot with extreme wide angles like these, you will notice that at F5.6 or F8.0 points at least from 3m to infinite will be sharp when focussing at infinite and you will find no different focus position that will make these edges sharper. 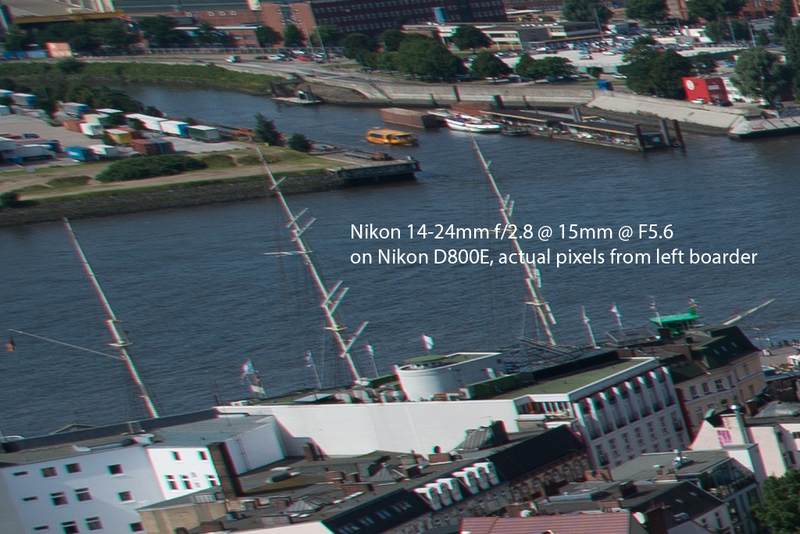 Overall there is no general winner in this aspect. 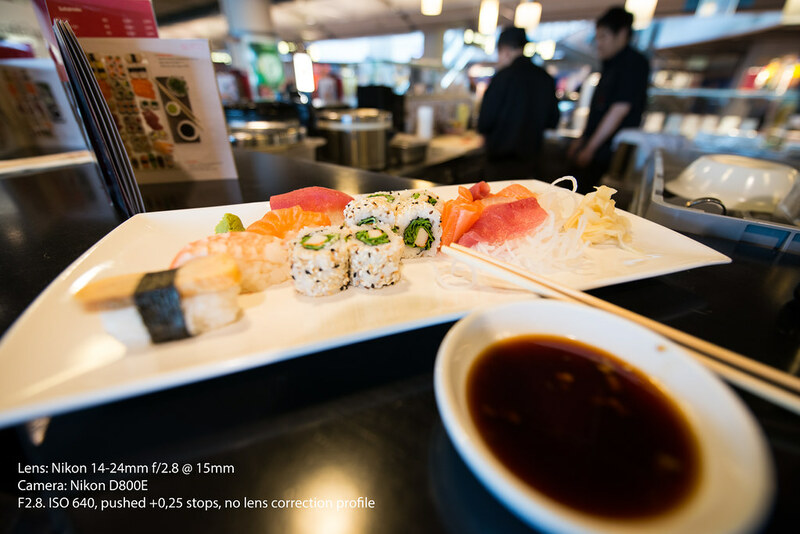 The Zeiss performs extremely well already at F2.8 whereas the Samyang should be stopped down at least to F3.5 or 4.0 in good light / high contrast situations. 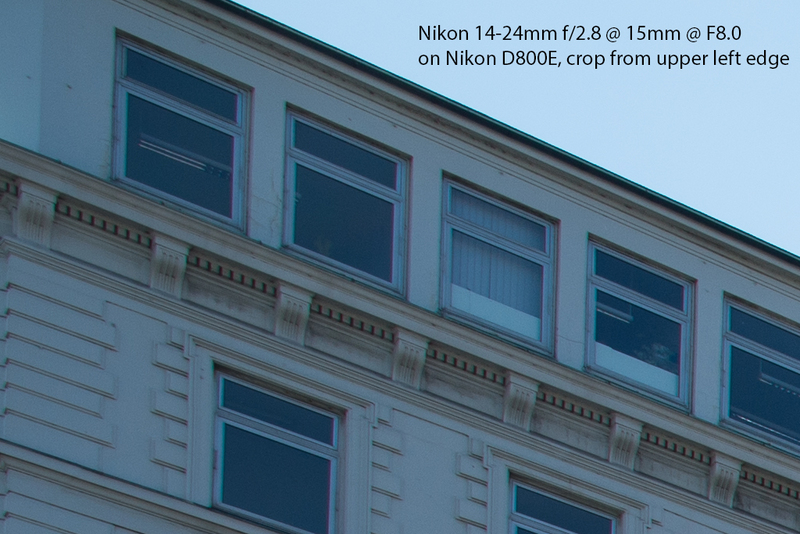 The Nikon zoom performs very balanced at 15mm. 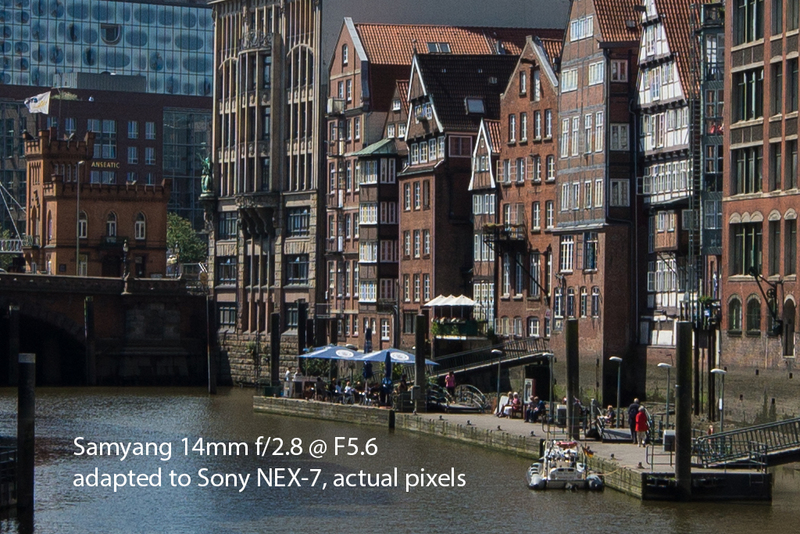 It is good at F2.8 but not as perfect as the Zeiss. 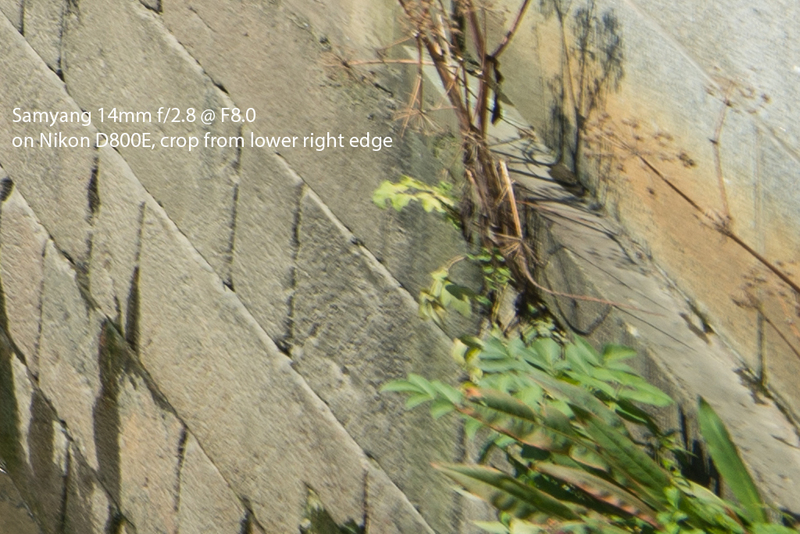 From F5.6 to F.8 all candidates show very good center performance but on the boarders and in the edges the Nikon zoom shows the best results. 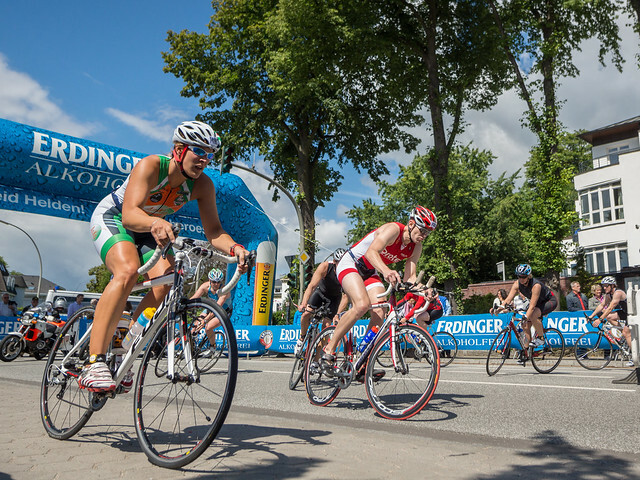 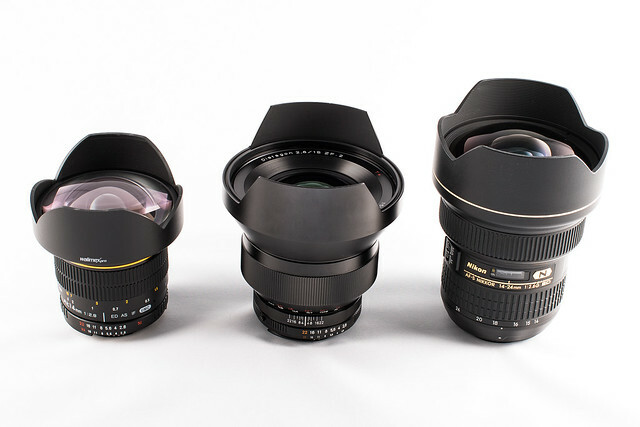 It may depend on your application area where which lens meets your requirements best. 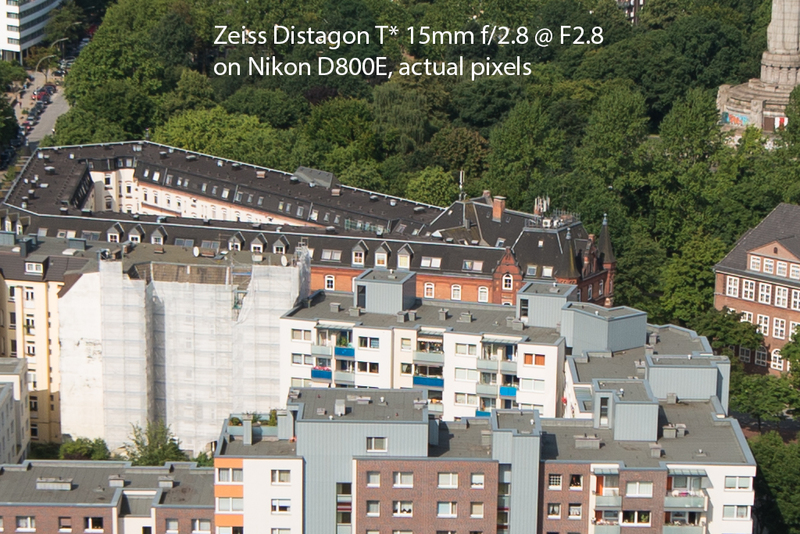 If you do a lot of work at F2.8, the Zeiss is you lens whereas the Nikon zoom is more universal. 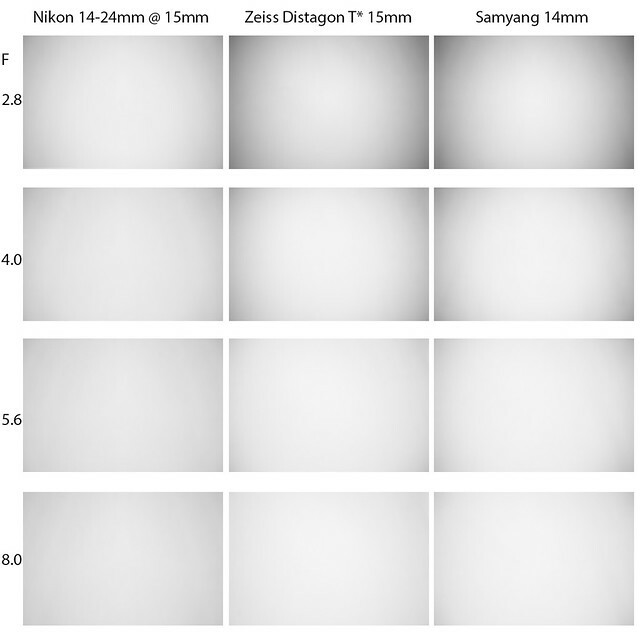 The following examples illustrate the degree of distortion and how the results can be optimized using a lens correction profile. 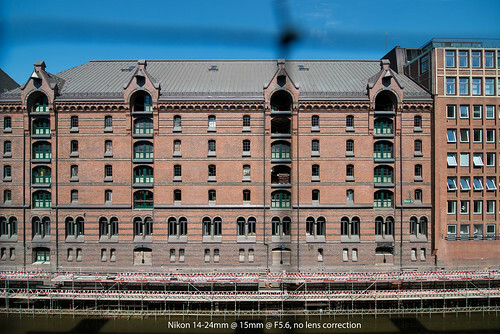 Please ignore the blurry black shades as these images had to be shot through a net protecting the building from birds flying inside. 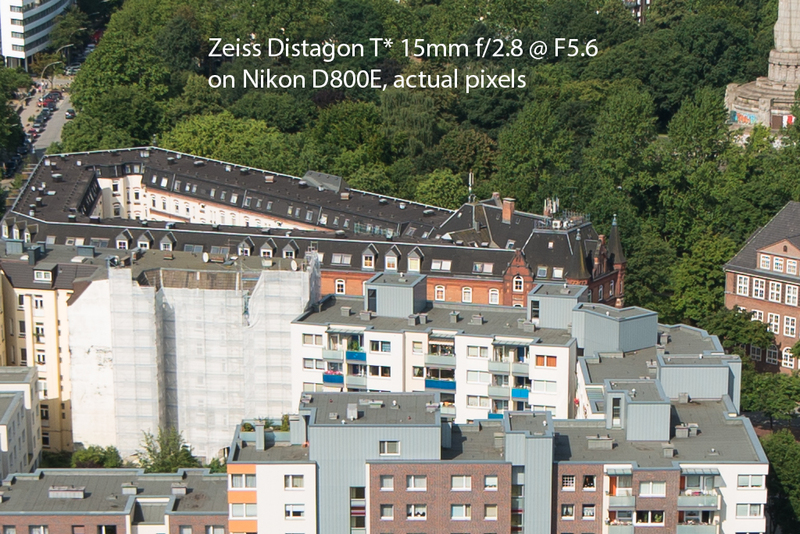 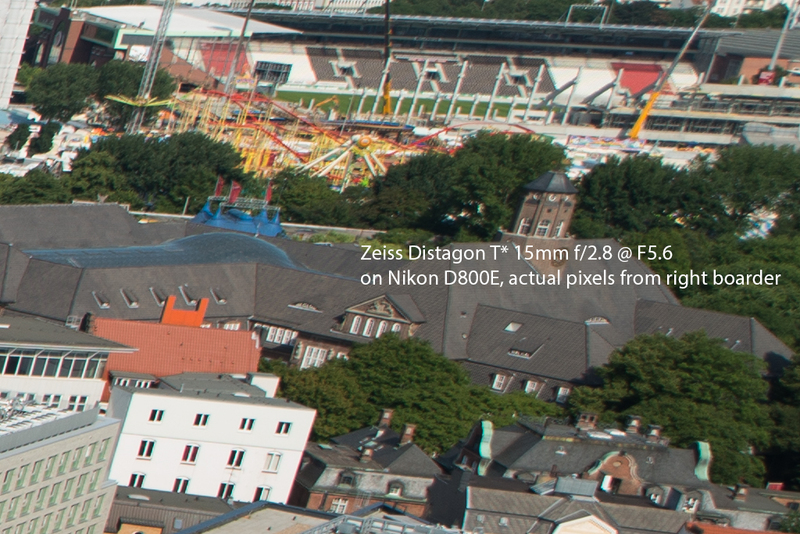 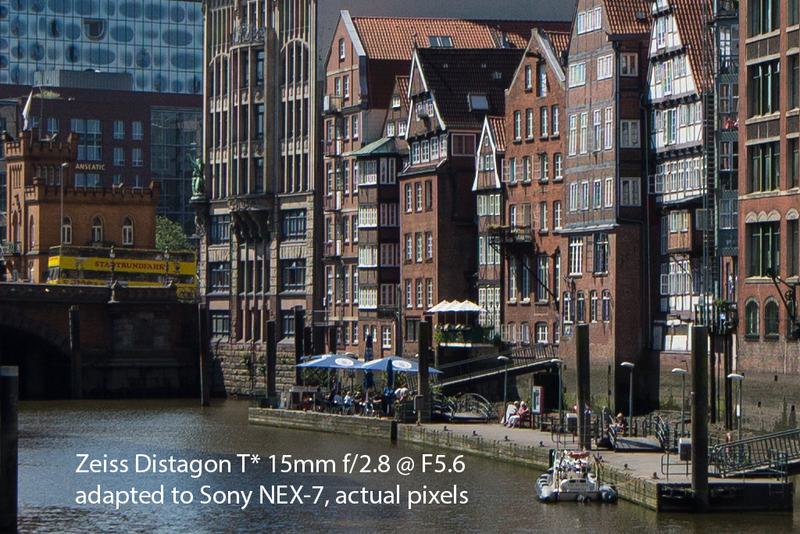 As you can see, the Zeiss produces the least distortions and needs only very little distortion correction. 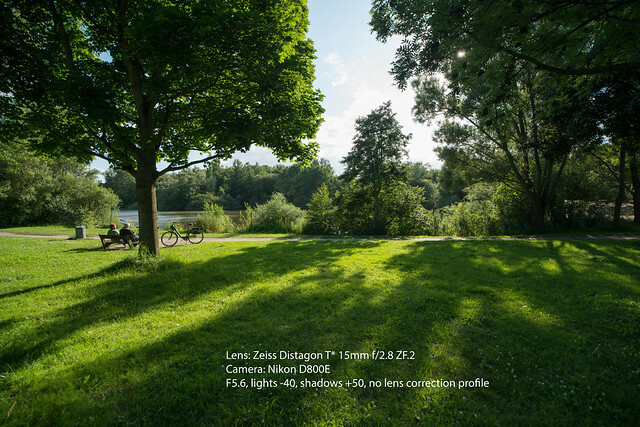 The lens correction profile for the Zeiss coming with current versions of Adobe Lightroom or Adobe Camera RAW plugin for Photoshop corrects also the vignette depending on the aperture used. 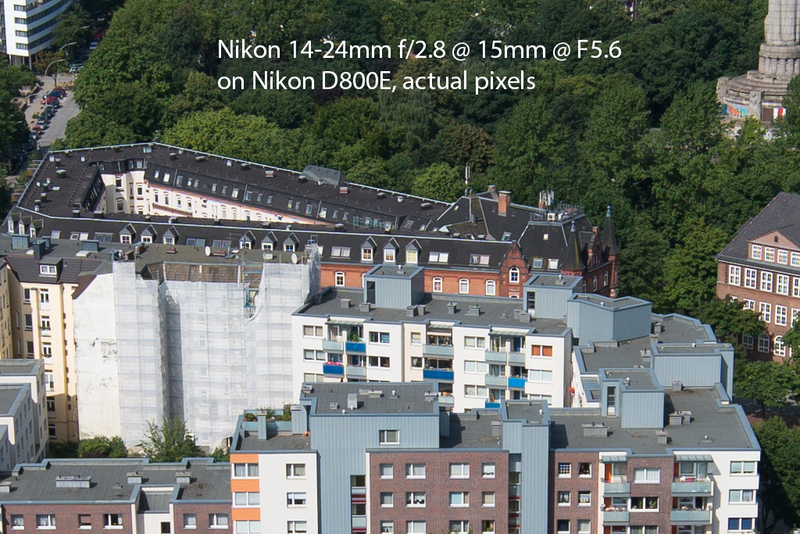 The Nikon zoom needs a little bit more distortion correction but less vignette correction. 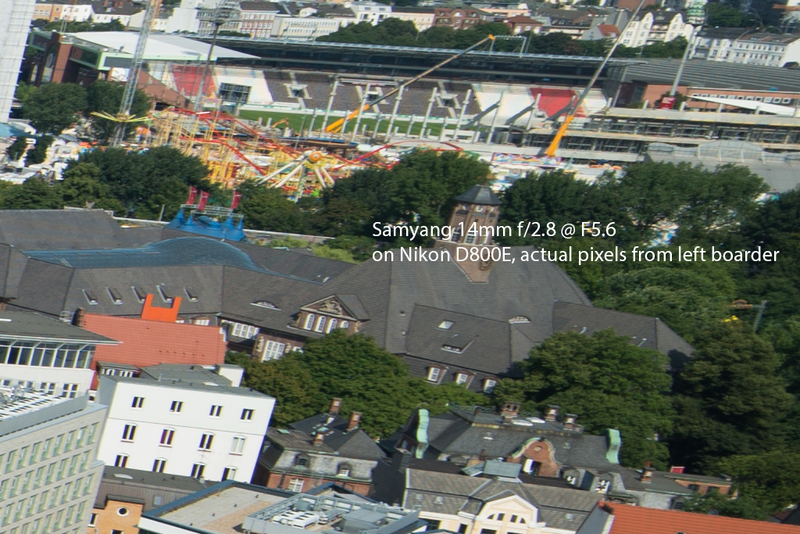 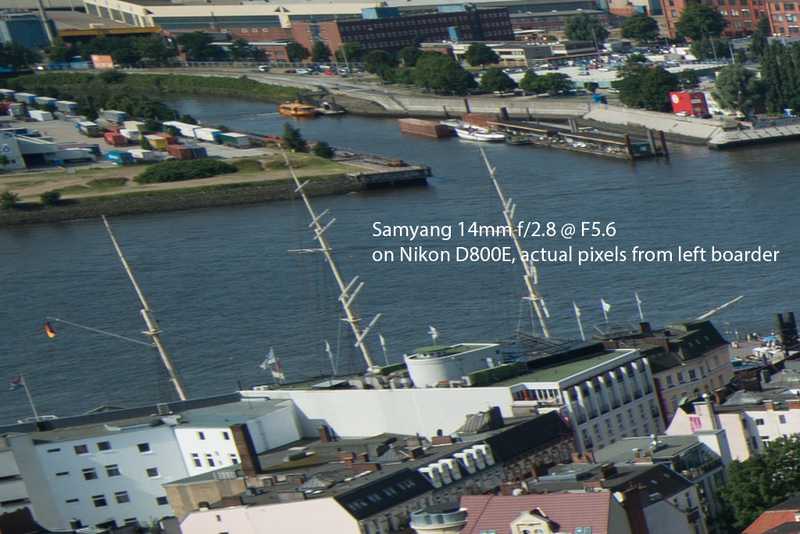 Most significant is the distortion produced by the Samyang which some articles compare to a "mustache". 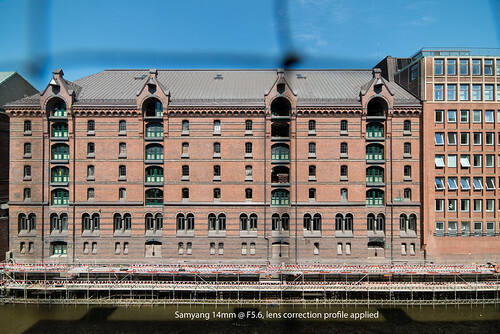 PTLens does but Adobe's Lightroom and Camera Raw do not provide a lens correction profile for the Samyang but meanwhile you can download and choose from several profiles using the download function built in Photoshop or the lens profile downloader. 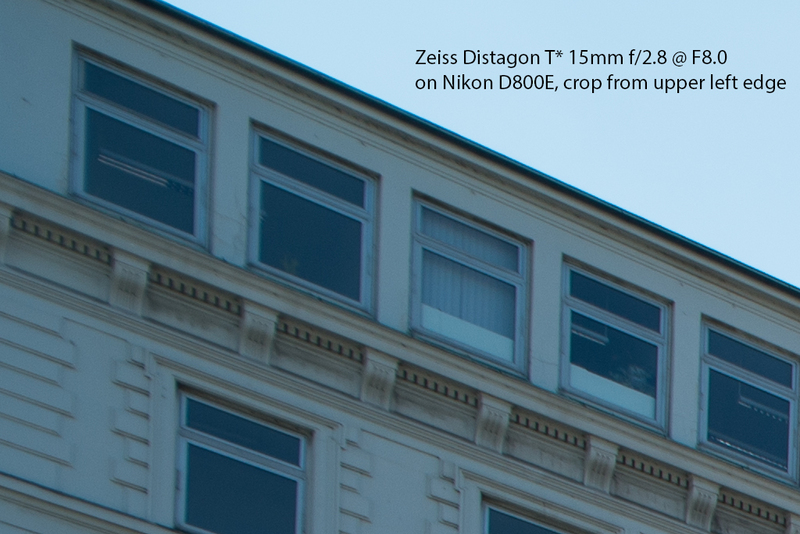 In this aspect the point goes to the Zeiss as with all these subsequent transformations you will loose some time and a little degree of resolution (but the Nikon D800E delivers so many pixels that you can get over this ;-). 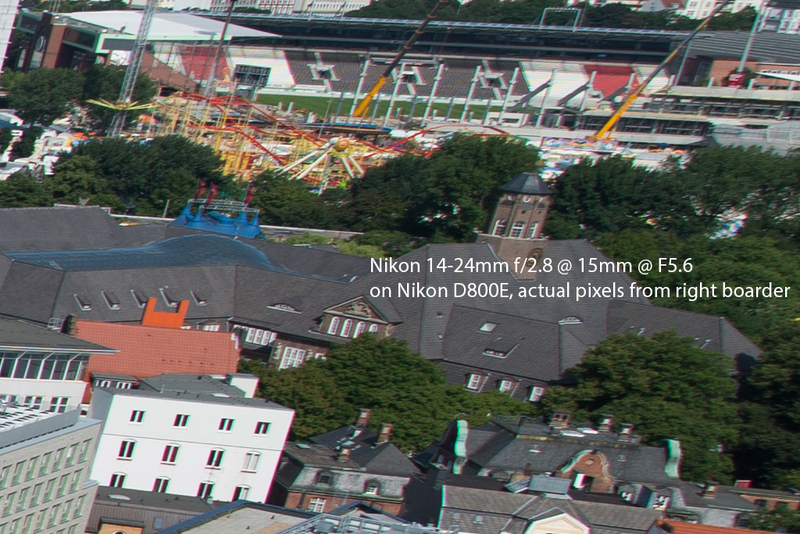 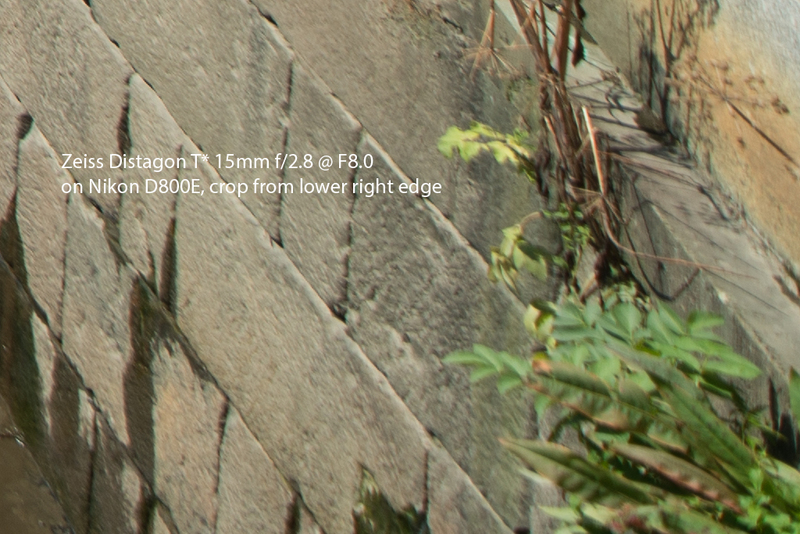 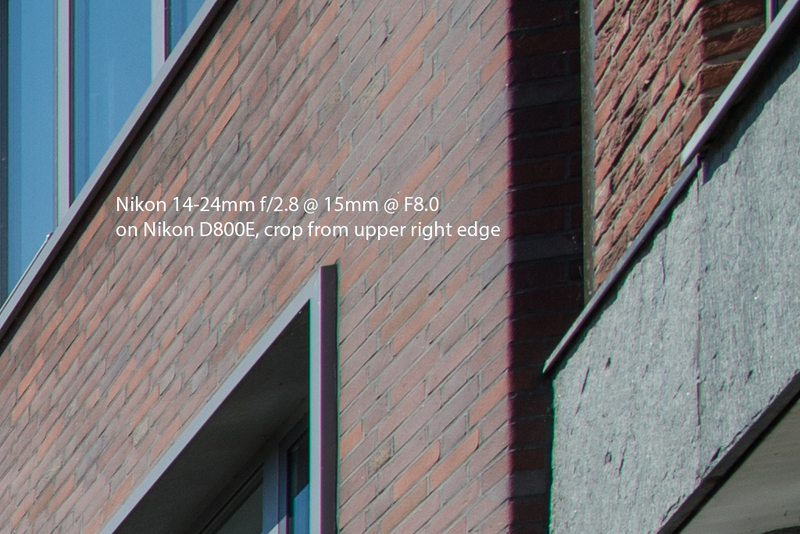 Regarding vignetting, the point goes to the Nikon zoom. 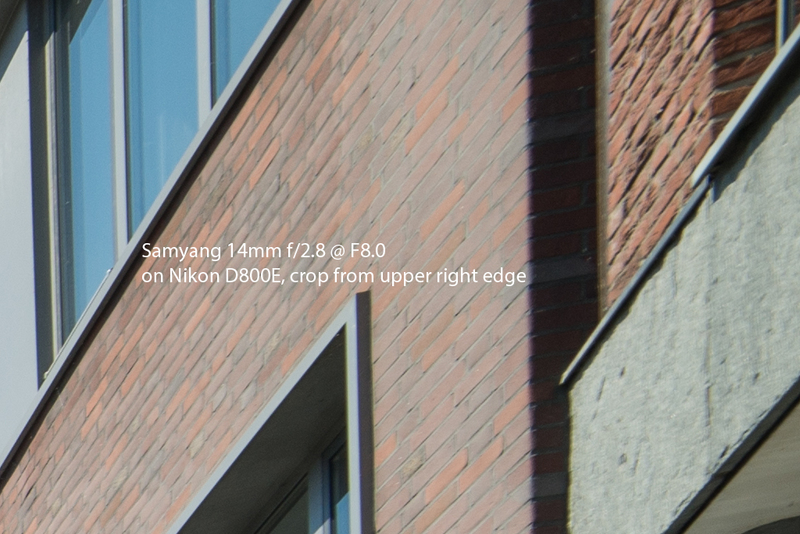 All three candidates are able to produce a nice bokeh and under these low light / low contrast conditions the results from the Samyang are acceptable at open aperture as well although in magnification you still will see significantly more micro contrast in the image taken with the Zeiss. 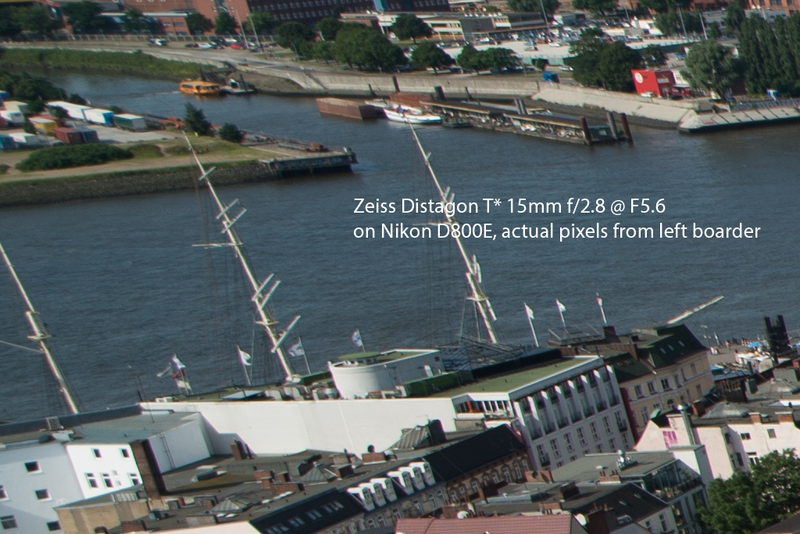 So in this aspect the point goes to the Zeiss again. 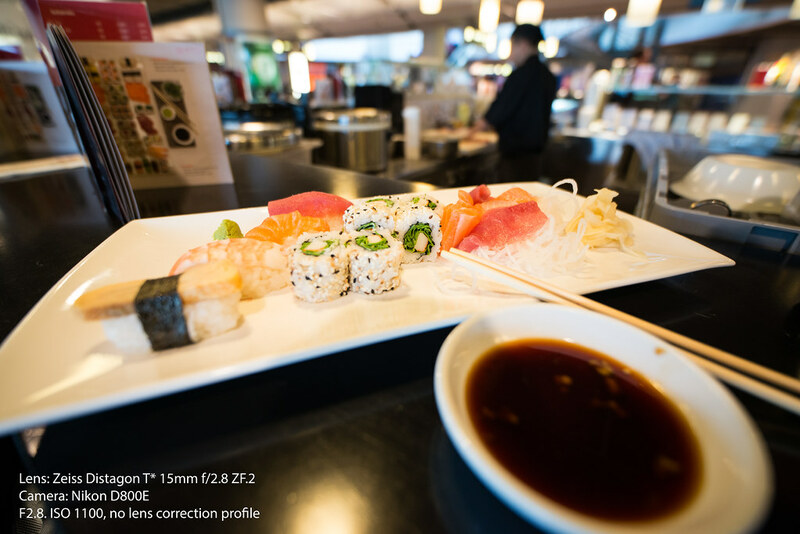 As vignetting, distortion and CAs can be quite easily corrected in post processing, these weaknesses should not be overestimated. 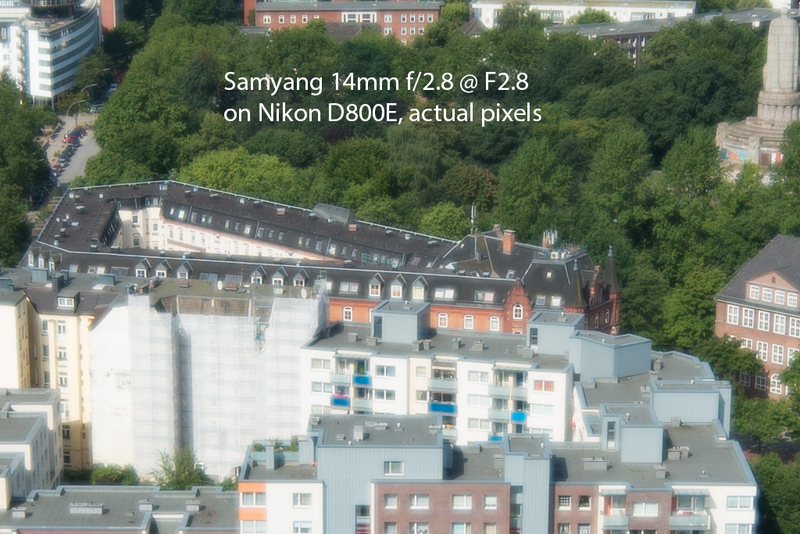 Overall, the Zeiss is the winner for me but regarding the price / value relation the Samyang is the biggest surprise. 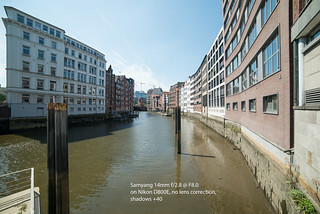 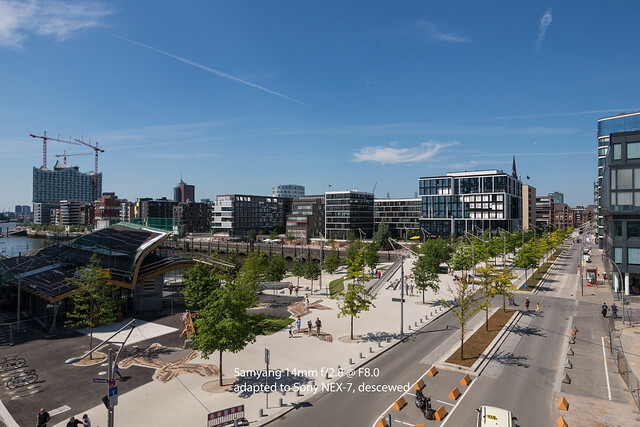 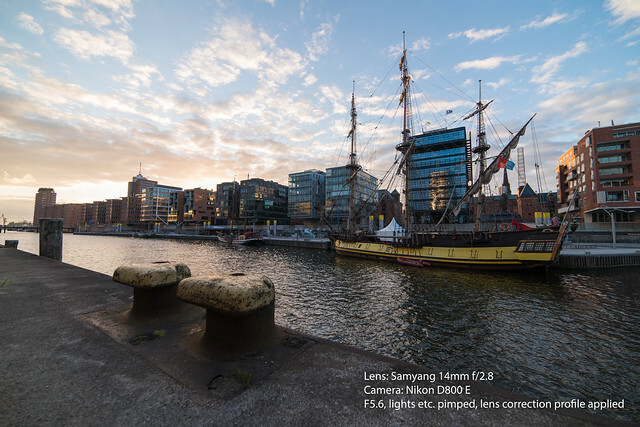 The same image taken with the Nikon zoom at 15mm and with the Samyang 14mm. 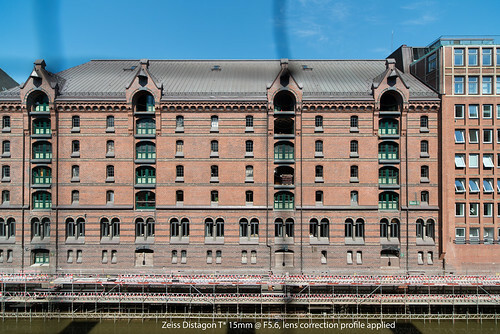 The same image taken with the Zeiss 15mm and with the Nikon zoom at 15mm. 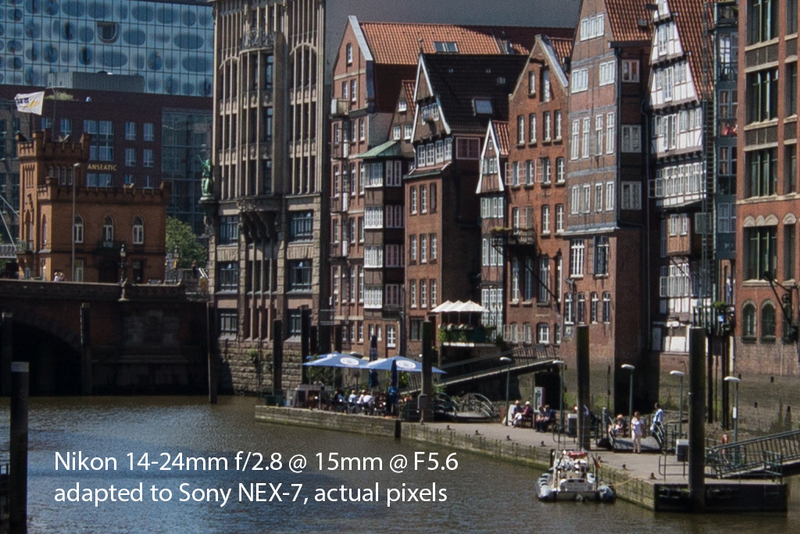 Shooting an ultra wide angle for full frame cameras on a Sony NEX-7 may look a bit strange but as long as other alternatives producing no colorshift are missing, this may be an option. 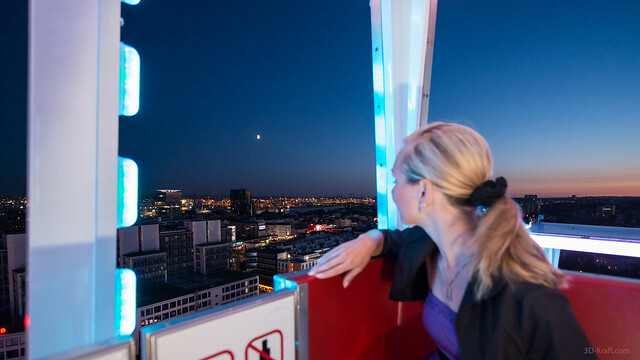 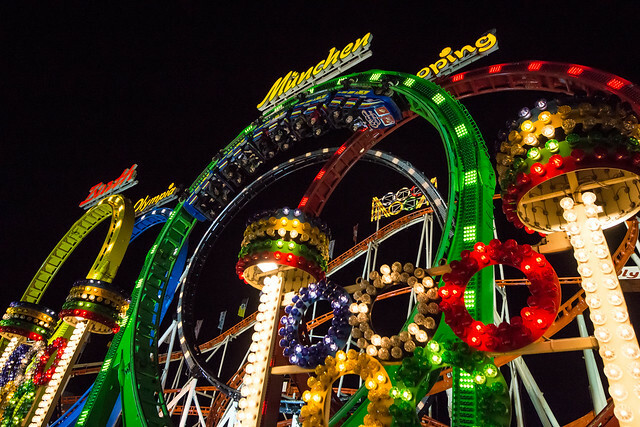 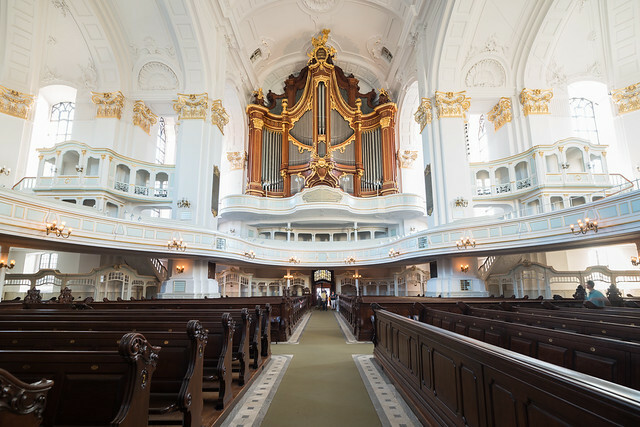 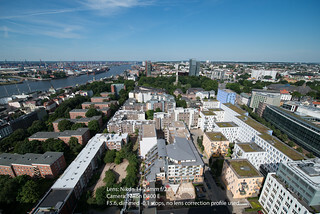 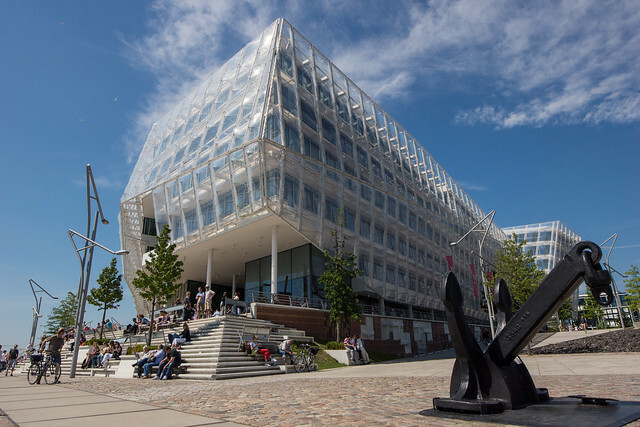 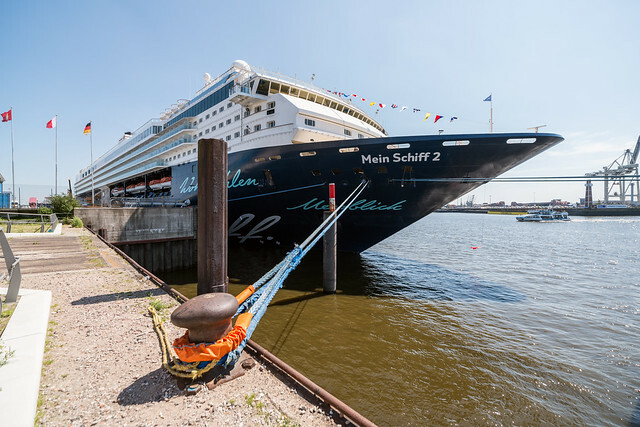 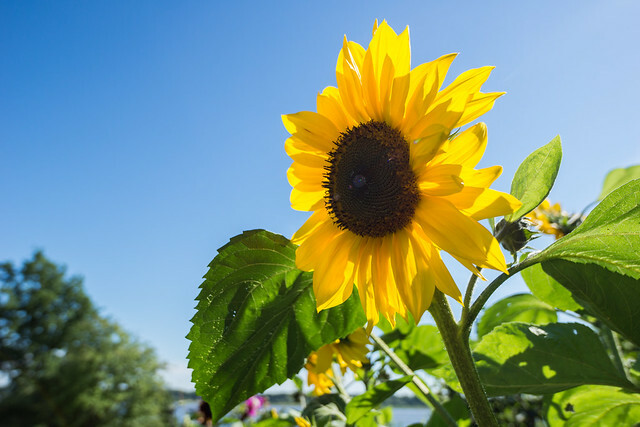 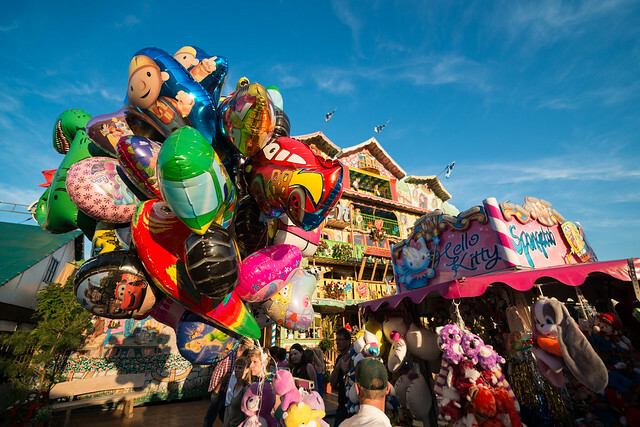 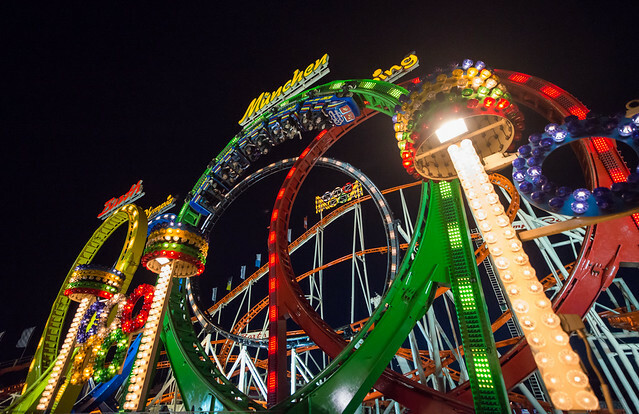 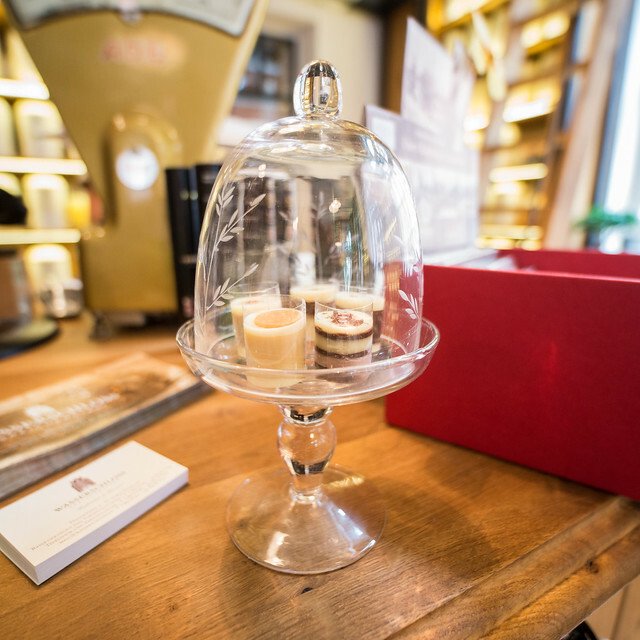 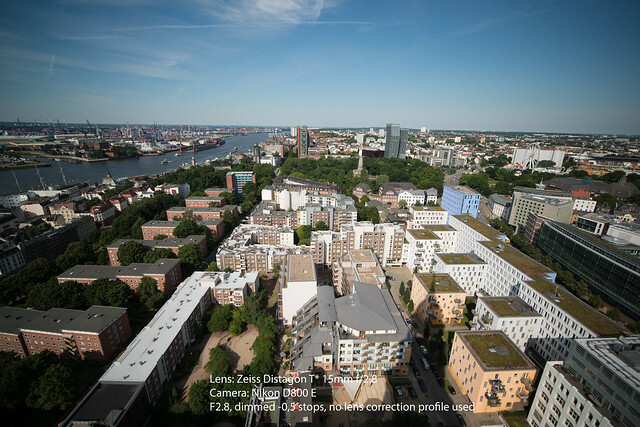 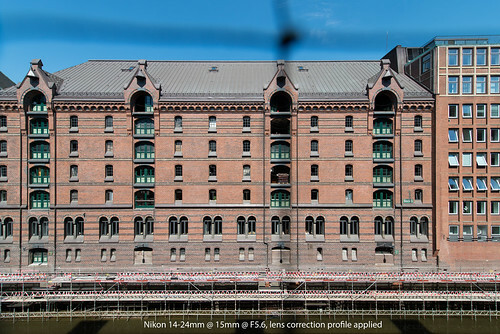 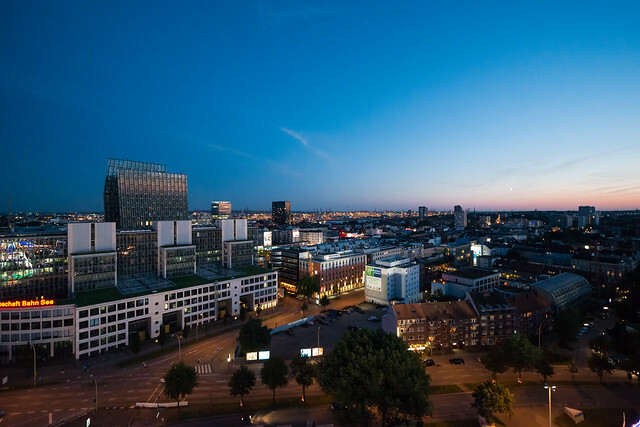 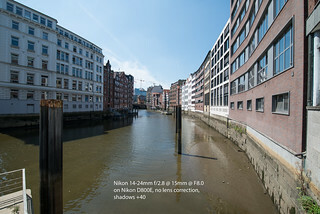 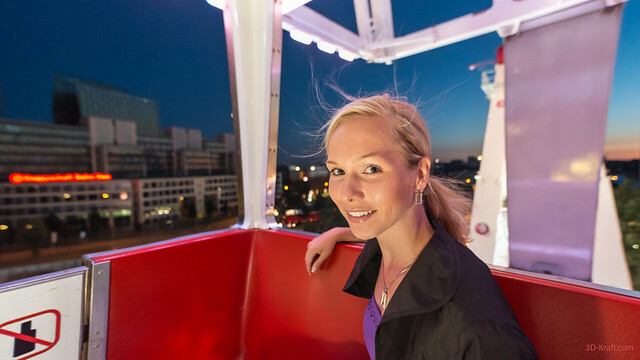 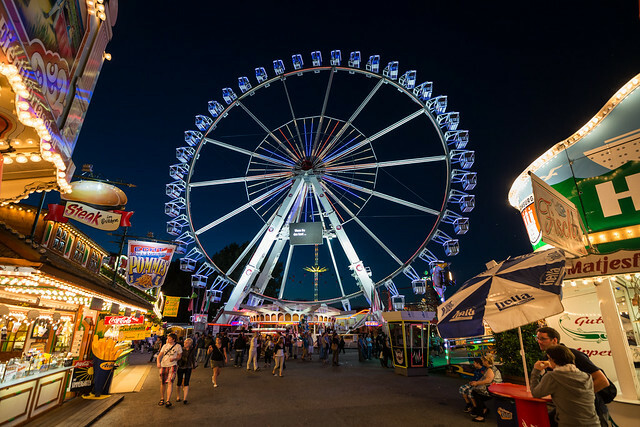 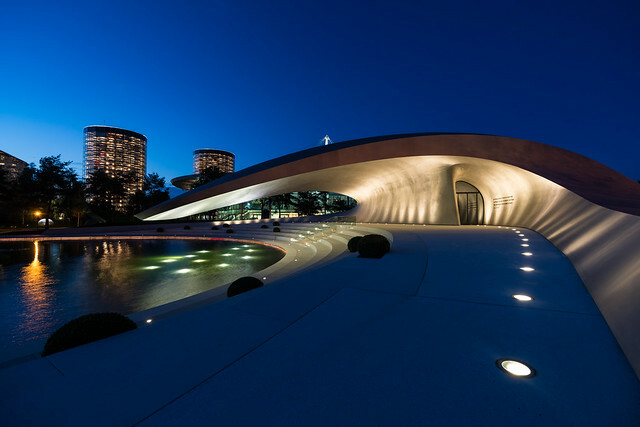 The same image taken with the 15mm Zeiss and with the Nikon zoom at 15mm adapted to the NEX-7. 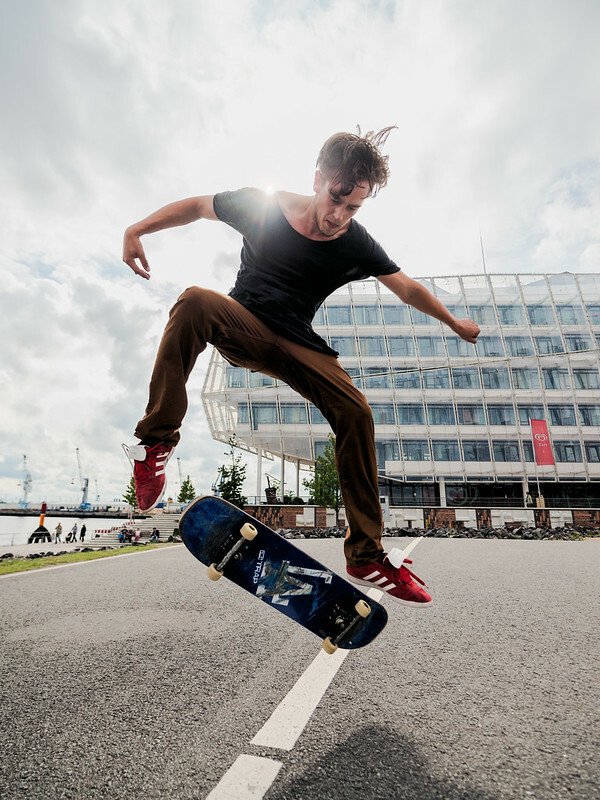 No guarantee / liability for misrepresentation. 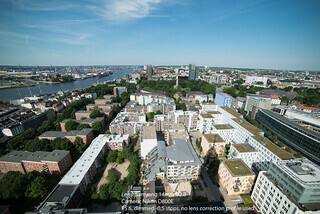 All images copyrighted by 3D-Kraft.com.